In Rugrats: Royal Ransom Angelica has claimed herself Queen of the Play Palace 3000 and has taken the Rugrats' most prized possessions. Now, you'll join Tommy, Chuckie, and the rest of the Rugrats as they wander through magical worlds to reclaim what is rightfully theirs. You can travel to nine fantasy environments--ranging from the snow and the ocean to the jungle and the moon--to discover bonus levels and multiplayer games. The game's various modes will have you flying on a magic carpet, racing a snowman down a mountain on a sled, cruising on craters in a moon buggy, and more. 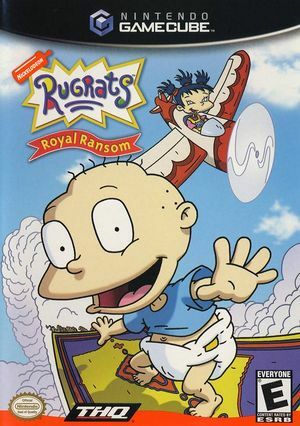 The game's plot is loosely based on "Rugrats: Castle Capers", except the castle is replaced with one of Stu's inventions. The graph below charts the compatibility with Rugrats: Royal Ransom since Dolphin's 2.0 release, listing revisions only where a compatibility change occurred. This page was last edited on 27 February 2018, at 12:17.